Installed this window yesterday, very pleased as we managed to remove the old glass panes from the old sashes, and re-use them in the new window. The day before we did this – a cedar sliding door and window. up in a horse farm. the view was lovely. 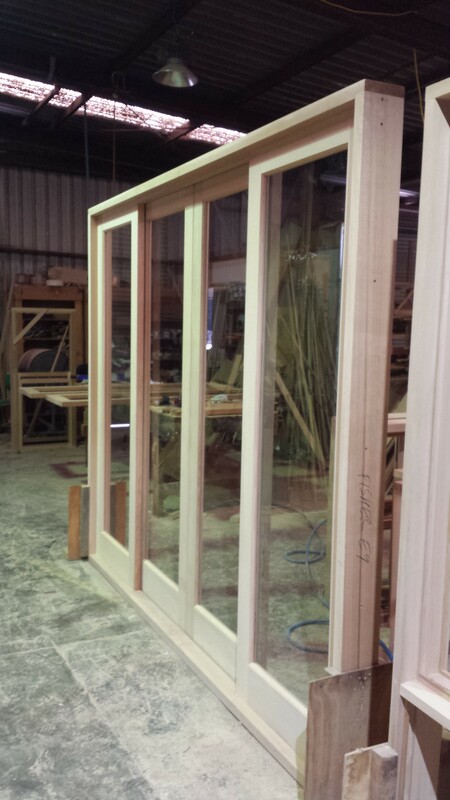 Cedar sliding window and door. brown aluminium single hung windows with timber surrounds. this one is 2100 high x 1800 wide (pretty standard sizing). Clear laminate glass and a flydoor. Assembled and tested in our steel jig to ensure squareness and smooth operation. Probably the most common sliding door we make. Most of the pictures of work lately has been in timber. we do lots of aluminium as well, so here is a photo of a sliding door in bronze anodise with 007 diamond grille security screen. 4mm toughened glass. All assembled and tested within our jig to ensure the frame is square, and everything locks and operates perfectly. this particular door is 2095 x 1810 – fairly close to a standard sized door frame. 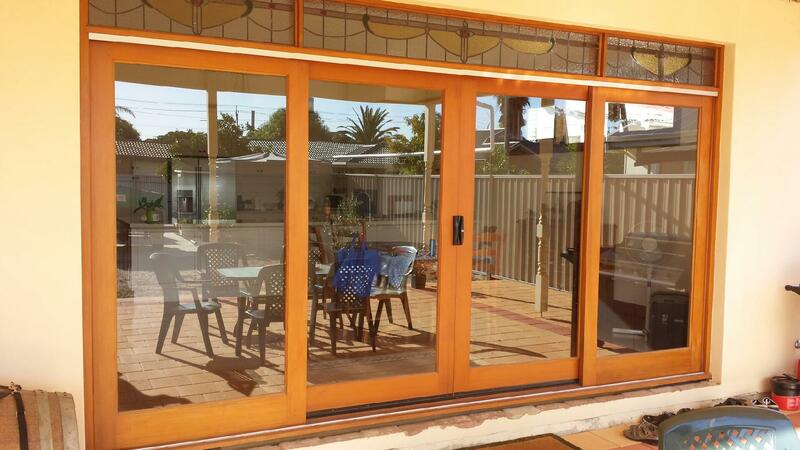 This is a 4 panel sliding door (2 active sliding doors, 2 fixed panels on either end). glazed with 6.38 clear laminate glass. 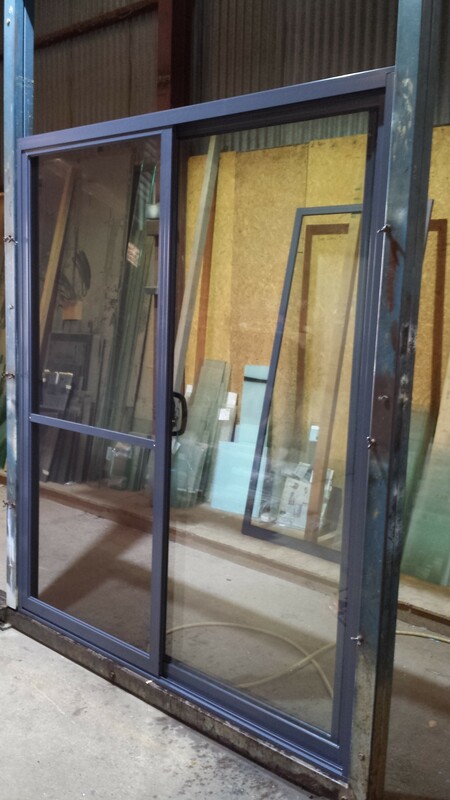 This is a finished sliding door, with a flydoor. Powdercoat is IRONSTONE, and you can see it is sitting within our steel jig to ensure the door is square and works perfectly before being taken by our client. 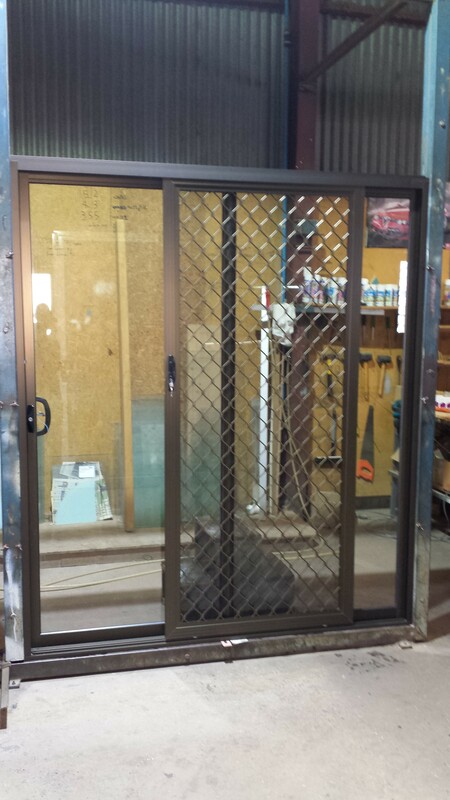 IRONSTONE powdercoat aluminium sliding door, with flydoor and clear 6.38 laminate safety glass. Over a year ago we made some windows and doors for a residence. They have finally installed, varnished and finished these doors and today we took a picture of them; they turned out very nice. Western Red Cedar Sliding Door with 2 opening panels.